No matter what you think of Apple or its products, there’s no denying that the company sets the standard when it comes to mobile updates. Within just two days of its launch, iOS 12 adoption had reportedly hit 10.4%. This number was down significantly over the 15.91% adoption rate achieved by iOS 11 the year before and suggested iPhone users were more reluctant to update after the bugs found within previous versions of the operating system. Now, just under two weeks later, though, the latest figures are painting a different picture. By the two-week mark, iOS 11 had reportedly been installed on a considerable 38.5% of all iPhones and iPads. However, the adoption rate registered by version 12 of Apple’s mobile OS dwarfs this previous number significantly at a whopping 46.57% of all devices. This figure almost puts the new version on par with 2016’s iOS 10 which could be found running on 48.16% of all devices two weeks after launch. 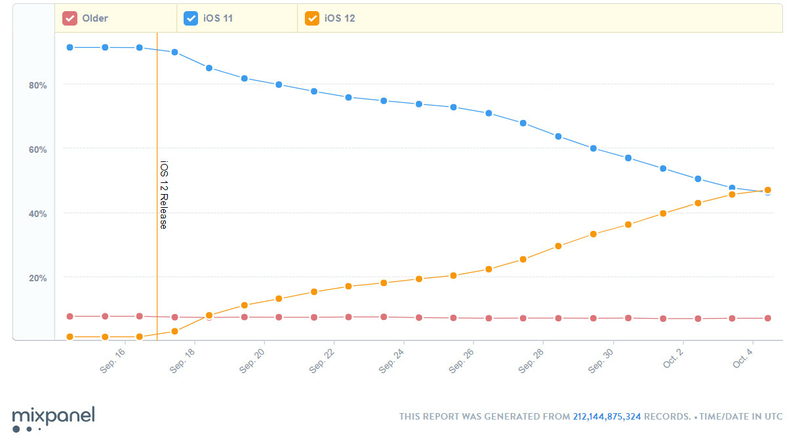 It’s unclear why iOS users have suddenly embraced Apple’s latest update at such a rapid rate. But it presumably has something to do with the big performance improvements that come with it. After all, while the update does improve the experience on recent iPhones, it brings a big boost to much older devices including 2013’s iPhone 5s, something that will undeniably please users. and 99% of all ios 12 users have the charging bug. I don’t have that bug. You have it but.... your old iA$$ is no more sensitive for iDick. You are stupid. Even my iphone 6 and Ipad air do not have it. You are just jealous that we have the latest OS while you still stuck at Nougat. When was the last time you had some... update? iOS 12 has been a very good update so far (for me). No issues to speak of other than the occasional swipe to go home, that puts it in to fast app switchinginstead, no chargegate, or connection issues. I got a good model, and it has the best battery life I've seen in a phone. 12.1 beta has already squashed the charging big, so it's just a short wait for the public release...no biggie, but it shouldn't be there in the first place. No pass for Apple, for releasing an update that centered on stability and performance, and then having stability and performance issues out the gate. Funny how the flock ignores them. Bad Apple. 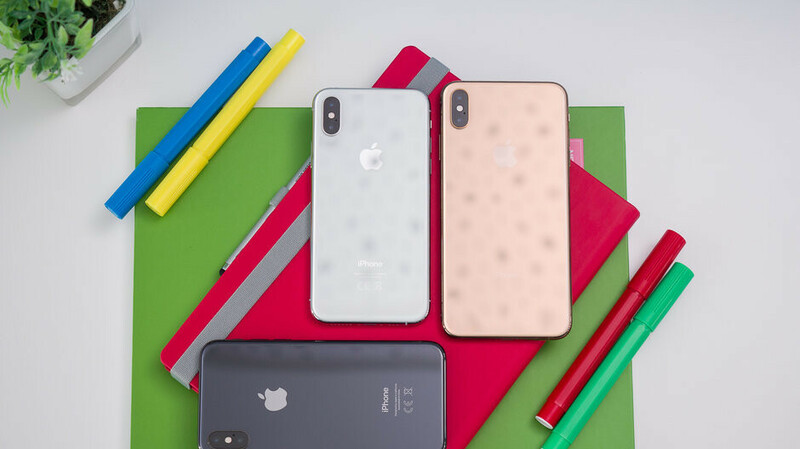 Which iPhone do you carry? 256 gig Max, and a 512 gig Note 9. Charging bug is not a stability issue you stupid idiot. It's a bug in a legit software feature on iOS 12 which was introduced by Apple to fight brute force devices like GrayKey used by law enforcement. It doesn't effect the stability of the operating system what so ever, instead it looks like the only stability that has been effected by this charge gate is your Mental Stability. Quit being a fake Apple fan and embrace your failing cheap android garbage. I just wish they ported their new HDR algorithm to the X, but that's understandable, the new image processing is a key selling point for the XS and XS Max. But iOS 12 as a whole has been superb. The last few iOS 11 builds slowed down my wife's X and affected the battery life, she was frustrated with her phone and was looking into trading it. But after updating it to iOS 12, she is more than happy with her phone again, the UI extremely smooth, snappy, faceid has become much much faster and more accurate, battery life has improved as well. Very solid update, and pretty polished too. Just a couple little things, but iOS 12 has been dope. It's their Apple article quota, where at least half the front page should be about praising Apple with a passive article or two not completely praising Apple. Blah blah bliddy blah Android fragmentation bad, Apple good. Not an Apple hater but also wondering why this is news? If Google had the ability to push updates out without carrier or manufacturer intervention the stats would be similar. Also, as there are 3 iPhone's in our household I can attest to the fact that when Apple wants you to update or add security or whatever, they are relentless at reminding you until it's done. Even not wanting to setup passcode on my iPad on IOS12 nets me reminders and a badge reminder that setup is considered incomplete. Point is, Apple can twist peoples arms to "strongly encourage" the updates. Having said that IOS12 is one of the first major updates that didn't noticeably hurt performance on older phones. Not sure an older 6S is faster but it certainly isn't slower. No it's more like imagine if Google forced phones to download the updates and continue to remind you about updating permanently or else it will continue wasting space on your limited non-expandable memory. Why can't Google update its phones (the pixels) the same as Apple?! In IOS 12 there's the option to stop automatic updates so, if you so wish, the OS will never let you know that you have an update. Of course there was a rush to update to IOS 12, IOS 11 was such a mess. The reason the first week did not enjoy higher rates of adoption is at last iPhone users are realising updated on IOS is like Russian roulette. You play with your phones life. it's very impressive that 5 year old phone can run newest OS. Yes it can run it but in a limited capacity. Try opening more than 4 apps and watch them start closing and they don't want to reload, try running any decent game, it wont happen. A lot of 3rd party apps are a no go as well. The 1 gig of ram is a huge limitation. If just used for calls and texts and as a camera it's fine, but anything else is not great. And before you say anything, yes i do own a 5s that i save to see what state IOS is in when i'm bored. 1GB Ram is enough for most tasks, it's not huge limitation, it's very small limitation, my second tablet iPad Air have 1GB and it never was a real problem. Only thing which i noticed in everyday use was if i had many tabs open it reloaded them sometimes. 5s is still good phone for average use, you can run lot of apps with that, sure you can't run heavy games that, but hey it's 5 years old. "but anything else is not great." i don't think anyone else than you expect it to be great, it's still 5 years old. I’ve been using the 5s and almost everything runs well. It’s not the best device for heavy multitasking but I would say 4 or 5 apps can been held in the memory. What I know is that I can still write a report with tables etc using Pages very comfortably. I can still update some of my spreadsheets on the go using Numbers. Browsing the internet is smooth most of the times. Even gaming is rather good. I was trying Hungry Shark which is not s light game in graphics but it still runs well. The phone is suprisingly usable for a 5 years old device. I gotta say, this place has turned into a cesspool lately. Can’t even acknowledge any good quality either platform has without some douche’ pestering you. We haven’t reached BGR level nonsense yet, but I feel like we’re getting there.